Boykin was also arrested a year ago in connection with an auto accident in Texas. 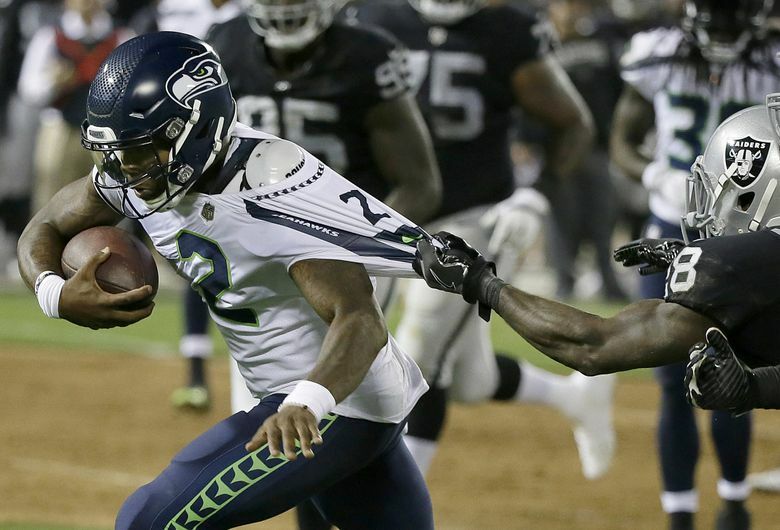 The Seahawks released third-year quarterback Trevone Boykin on Tuesday after a Dallas TV station reported he is being investigated for assaulting his girlfriend following an incident last week in Mansfield, Texas. The report from WFAA-TV in Dallas detailed an alleged assault last week that left Boykin’s girlfriend, Shabrika Bailey, with her jaw broken on both sides. The TV station reported that police in Mansfield, Texas, were investigating the allegations. Boykin is expected to be charged with aggravated assault, a felony, TMZ reported. In an interview with WFAA, Bailey said she had a constricted airway and trouble breathing due to injuries suffered in the incident and was airlifted to Parkland Memorial Hospital in Dallas for treatment. She was released from the hospital Saturday, three days later, according to the report. It is the third time Boykin has been arrested or investigated since December 2015, and the second time during his Seahawks career. Boykin was arrested last March following an incident in which he was a passenger in a car that hit the Sidebar Bar in Dallas, also hitting seven people on a crowded sidewalk. Seven people were taken to a hospital because of injuries that included a broken ankle and dislocated arm, according to police and other reports. Boykin, who played at TCU in nearby Fort Worth, was arrested at the scene for possession of more than two ounces of marijuana and public intoxication. The WFAA story published Tuesday quoted Bailey as saying she was the driver in the March 2017 accident and that the accident occurred because Boykin was attacking her. That case was dismissed last month. Boykin also was arrested for resisting arrest following an incident at a bar in Fort Worth in December 2015 that resulted in him being suspended for the Alamo Bowl. He was signed by Seattle as an undrafted free agent following the 2016 NFL draft. He spent the 2016 season on the active roster as the backup to Russell Wilson, playing in five games while completing 13 of 18 passes for 145 yards, one touchdown and one interception. Boykin lost the backup job in 2017 to veteran Austin Davis and spent the season on the Seahawks’ practice squad (they later said one reason for naming Davis the backup is that he did not have practice squad eligibility while Boykin did, which allowed Seattle to keep both players). Boykin was re-signed in January and was the only other quarterback on the team’s roster aside from Wilson before his release Tuesday, with Davis still an unsigned free agent. The team could re-sign Davis, who with having played for the Seahawks last season also played for new Seattle offensive coordinator Brian Schottenheimer when Schottenheimer was the OC with the St. Louis Rams from 2012-14. Davis started eight games for the Rams in 2014. Later Tuesday afternoon, Boykin released a statement to Ian Rapoport of NFL Media saying that the accusations against him are untrue while stating he understood Seattle’s decision to release him.